CLASSIC Continue your Guided Sightseeing of the Angkor Temples at Ta Prohm. Tree roots cover the ruin walls, allowing you to experience the temple with the same wonder as early explorers. Then visit Banteay Srei, a unique temple built on a small scale from red sandstone, which can be carved like wood. En route, stop at a local village famous for making Khmer noodles by hand. Participation in this vacation requires requires purchase of the following flights from Avalon Waterways, not included in pricing: (1) roundtrip air from your U.S. gateway and intra-vacation air segments; or (2) intra-vacation air segments only, starting at $760. 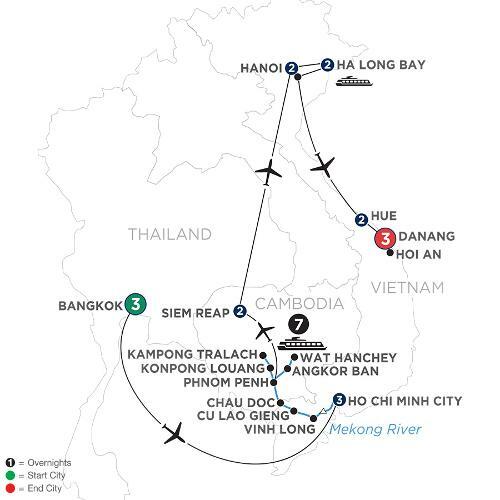 Required intra-vacation air segments are Bangkok/Ho Chi Minh City; Phnom Penh/Siem Reap; Siem Reap/Hanoi; Hanoi/Hue. Air prices were effective on February 6, 2019, and their availability is limited. At the time you purchase your tour, air prices may be higher.